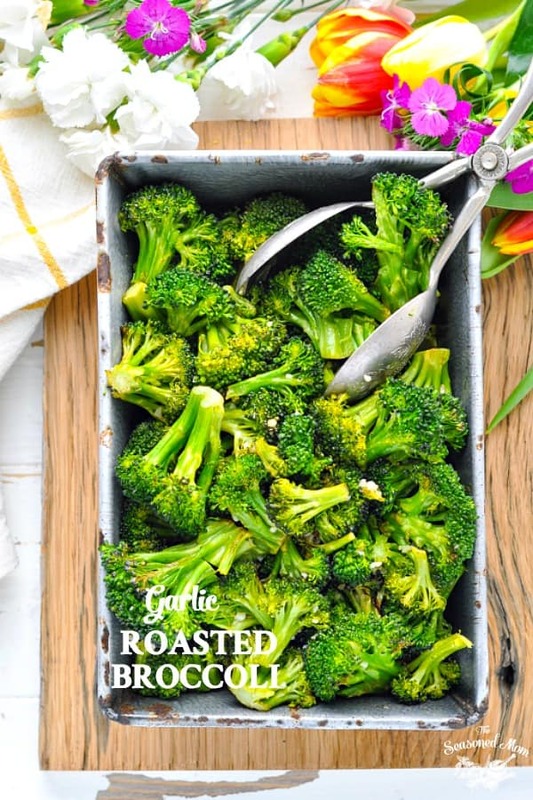 This Garlic Roasted Broccoli recipe will quickly become your family's favorite side dish! 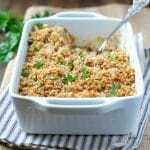 If you need a healthy side dish that will add some green to your plate, then you have come to the right place! 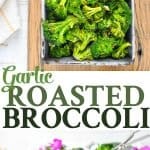 Forget about soggy, flavorless steamed broccoli, because this Garlic Roasted Broccoli Recipe will quickly become your family’s favorite veggie! 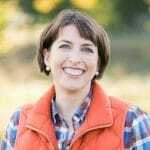 With spring upon us and farmer’s markets popping up again, I thought that it would be appropriate to offer a new quick-prep option for that head of fresh broccoli in your refrigerator. 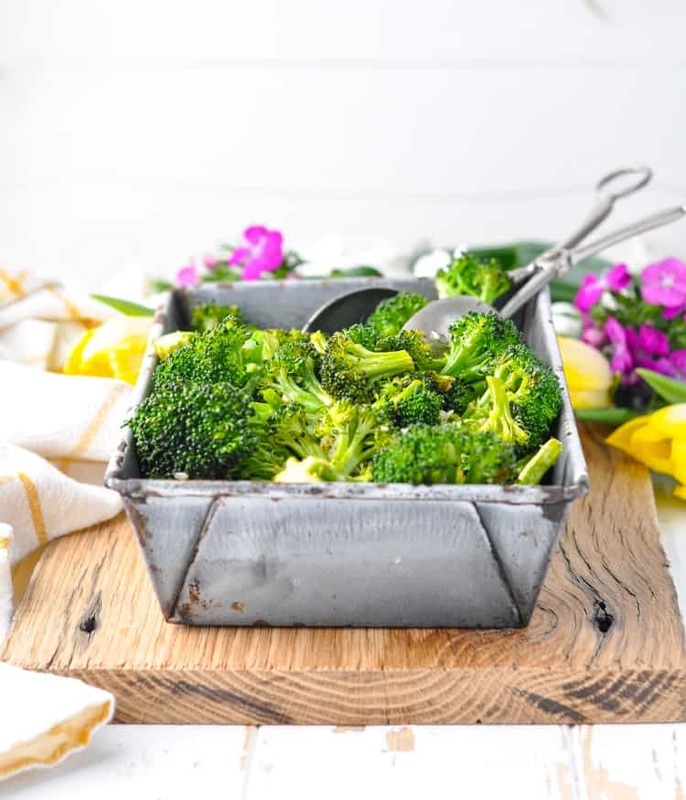 With a touch of garlic, a crispy exterior, and the natural sweetness that’s brought out as a result of the roasting process, this broccoli recipe is a winner that you will turn to again and again. If I’m going to serve a vegetable side dish more than once or twice, it better be REALLY easy. I’m too worried about getting an entree on the table each night — I can’t bother with fussing over the extras! Fortunately, this broccoli recipe only requires a few minutes of hands-on time and a few ingredients that you probably already have in your kitchen. 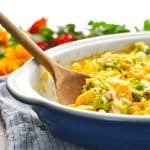 It’s healthy, it’s kid-approved, and it’s a great way to get you out of the frozen vegetable rut. 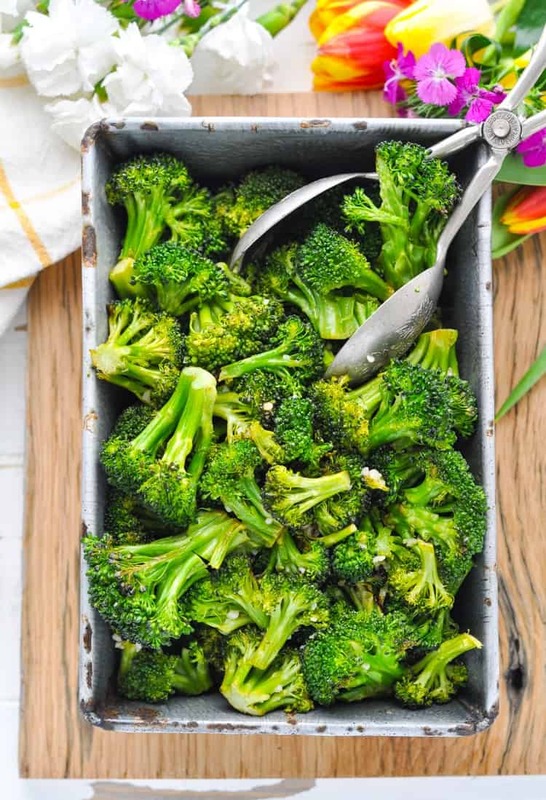 Yes, like all green veggies broccoli is extremely good for you and roasting it gives it such a wonderful flavor it’ll be super easy to incorporate into your weekly meals. Broccoli is a high source of vitamins C, K and A as well as iron and calcium just to name a few. It’s also packed with fiber helping you stay fuller for longer and low in calories, what’s not to love?! If you see yellow florets on your broccoli then that’s a sign that it’s starting to turn bad. You will also be able to tell by the smell, broccoli can take on a cabbage-like smell when it’s no longer fresh so you’ll know that it’s no longer edible. Cut broccoli into small florets. 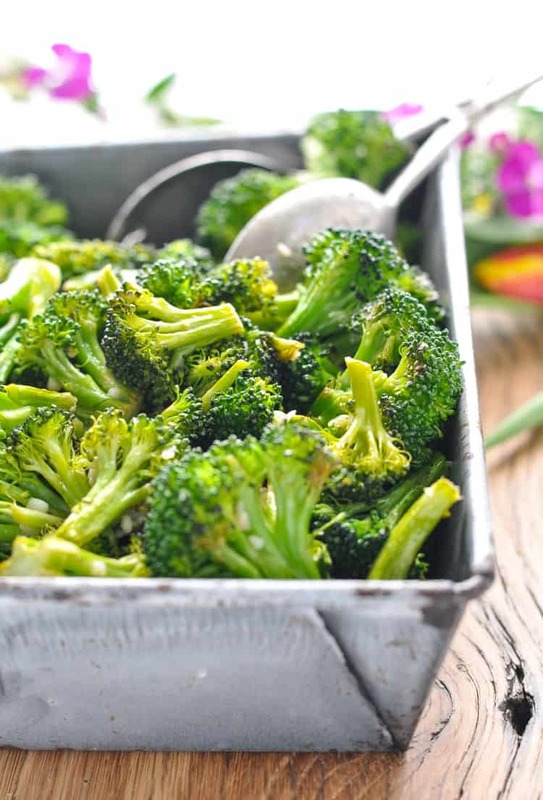 Place broccoli in a large bowl and toss with olive oil, garlic, salt and pepper, until evenly coated. Spread broccoli in a single layer on the prepared baking sheet. Roast broccoli until the edges are crispy and the stems are crisp-tender. This roasted broccoli is such a versatile side dish it will go with almost anything. 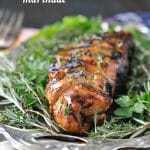 Why not try it with roast chicken, pork or beef? Alongside a juicy steak, grilled fish or even with some mac and cheese. Adjust the cooking time to suit your preference. I love a crispy, charred roasted broccoli, so I tend to leave the broccoli in the oven longer. If your kids don’t want much char on the outside of the broccoli, pull it out as soon as it’s tender (after about 15-18 minutes). Make sure to use fresh garlic (even pre-minced) and not garlic powder. Make sure your broccoli is fresh for best flavor. 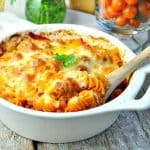 You can add additional seasonings such as spices, red pepper flakes or even parmesan. Leftover broccoli can be stored in the fridge for 2-3 days and enjoyed cold in salads or reheated as a side. 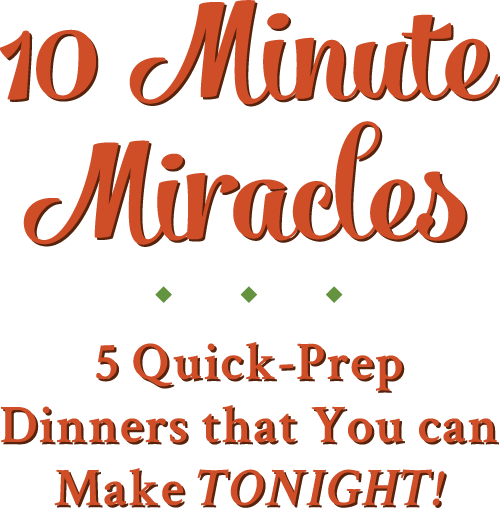 You can also freeze leftover roasted broccoli and defrost as needed. Preheat oven to 450 degrees F. Line a large baking sheet with foil and spray with cooking spray. Roast broccoli until the edges are crispy and the stems are crisp-tender (about 15-20 minutes). Adjust the cooking time to suit your preference. I love a crispy, charred roasted broccoli, so I tend to leave the broccoli in the oven longer. If your kids don't want much char on the outside of the broccoli, pull it out as soon as it's tender (after about 15-18 minutes). Previous Post: « Dump-and-Bake Lemon Chicken + a Video! I gave the florets several liberal shakes of lemon pepper. Killer stuff!!! For a couple of years now I’ve done this same thing with a crimini mushroom/asparagus dish. It’s a meal in itself and I have to make it at least once a week, sometimes twice and as a certified die-hard carnivore that’s saying a lot. Blair, the casserole dish is beautiful! Is it metal or ceramic? Hi, Lynn! It’s metal! It’s kind of like vintage enamelware, and I found it at an antique store near my home here in Virginia. Sorry that I don’t have a specific link to share it with you online. What brand of lemon pepper. The one I bought is very artificial tasting. 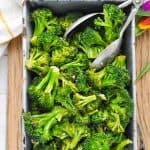 Love roasted broccoli it’s just 10x better than steaming or boiling!